It is a matter of pride and pleasure that the 500th issue of your favourite eNewsletter from India is in your hands. It is an important milestone and we thought of celebrating with articles written specially by well-known wine experts globally. I feel privileged with a hundred percent response from my wine friends since it shows their solidarity with what delWine stands for. When we started delWine in 2006, it was a cut and paste type of newsletter to help people in wine industry check out the happenings on a daily basis. Over the period, it has become a highly respected newsletter which often breaks news and even the mainline papers follow the lead and come out with their versions. The best compliment we got was from a very senior Italian wine personality who wondered how we could publish news that would be seen in Italian main newspapers after a couple of days! DelWine focuses mainly on my forte and passion-wine. Food is an integral a part of wine enjoyment but we continue to claim no specialty in the subject. We also continue to write a bit about hotels as they are an important vehicle to move wine-though they continue to treat it generally a commodity that adds nicely to their bottom line. We also continue to write about Retail in a restrained manner; this is going to be the most important vehicle in helping to increase wine consumption as the state governments become more and more responsive in allowing organized retail to add it to their portfolio. We continue to be as neutral and objective as possible. It is amusing that sometime people place ads-the limited amount we take to meet expenses, hoping for a special treatment and then leave abruptly when they see it doesn’t induce us to do them any favours. I am often accused for my views being a bit too negative and the criticism of the government a tad too harsh. I believe in telling it-like it is. We must not forget that wine is as new to the government as the consumer. They are experimenting too and at times there are lobbies, monetary inducements, political compulsions or simply an ignorance of the subject-especially the benefit of a low alcohol product like wine-or even beer. Therefore, our objective is to arm them with indigenous knowledge that ought to help in taking right decision -without paying the consultancy charge. I seriously hope that during the next 500 editions we shall continue to maintain our objectivity, integrity and sincerity in reporting and your feedback will be our strength. The people who have contributed for this edition which would be a ‘collector’s edition’ in Print Media, are top professionals who have devoted their life and career for the cause of wine. They are extremely busy people who occasionally write-for money. It is a matter of privilege for me and delWine that not only ALL of those I contacted affirmed and sent in their articles of choice, but also did it free of charge. I am personally obliged to John Salvi, Cathy Van Zyl, Debra Meiburg and Ned Goodwin –all Masters of Wine for sharing their thoughts or ideas with our readers. Robert Joseph is a man well-known in India and gives us useful insight to what has happened in the last 4 decades since he held a wine glass. Charles Metcalfe lives in UK but has written an excellent book on wine and food in Portugal. Michele Shah specializes in Italian wines and food as does Gerry Dawes for Spain. Joel Payne is a multi-national based in Germany. Willi Klinger has done wonders for Austrian wine promotion overseas and could be a role model for people genuinely interested in promoting Brand India. I have known Yair Koren from Israel as a journalist and TV personality for several years now. Fongyee Walker is an expert in Chinese wines and will hopefully soon join the illustrious band of MWs. Sourish Bhattacharyya used to be a wine friend and the first delWine editor who initially came up with the idea of the eNewsletter which I spontaneously christened as delWine (the ‘d’ represents modesty in my view). He is now a good personal friend too. In fact, I consider all the contributors as personal friends and don’t mind admitting I would have been disappointed if they had not acceded to my unusual request. Last but not the least, I would like to thank you-our readers who constantly give me the feedback and a pat on the back that is very encouraging. I was in Portugal recently where there were over 300 judges many of whom are journalists. I was really touched when many of them told me they receive delWine and read it regularly and congratulated me for the wonderful work being done by the eNewsletter. Honestly speaking, that works magic for me and I hope you all would be forthcoming with your feedback that will help me see through the next 500 issues, God willing. Happy reading! Cheers and please continue to drink wine- quality wine and moderately. Great achievement...looking forward to many more! 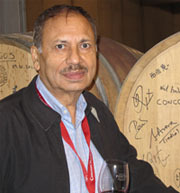 If I had not had the privilege of meeting Subhash Arora around the Vinous World personally I would have given him the accolade of Bacchus II but as Mr Bhattacharyya succinctly puts it there are no Godly pretensions about Subhash, he wears his mantle of knowledge and fame with great modesty.